As a doctor, Eric ran a highly successful chiropractic practice for 12 years until one day his patients began reporting that they felt his hands on them – even though he hadn’t physically touched them. Patients soon reported receiving miraculous healings from cancers, AIDS-related diseases, epilepsy, chronic fatigue syndrome, rheumatoid and osteoarthritis, birth disfigurements, cerebral palsy and other serious afflictions. All this occurred when Eric simply held his hands near them – and to this day, it continues. 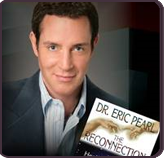 Today Eric travels the globe extensively throughout the year bringing the light and information of Reconnective Healing onto the planet. He teaches you how to activate and utilize this new, all-inclusive spectrum of healing frequencies that allow us to completely transcend “energy healing” and its myriad “techniques” to access a level of healing beyond anything anyone has been able to access prior to now! Join Georgiann and Dr. Pearl and get reconnected.